Acknowledged author wrote HEALTH LAW:CASES,MTRLS.+PROBLEMS Clean: Limited cribbing or fill-in's@ DUE 6/18,CLN @ comprising 1635 pages back in 2016. Textbook and etextbook are published under ISBN 1683288092 and 9781683288091. Since then HEALTH LAW:CASES,MTRLS.+PROBLEMS Clean: Limited cribbing or fill-in's@ DUE 6/18,CLN @ textbook was available to sell back to BooksRun online for the top buyback price of $91.42 or rent at the marketplace. Thirty years ago, the first edition of the Furrow Health Law casebook quite literally defined the subject of Health Law in the United States. 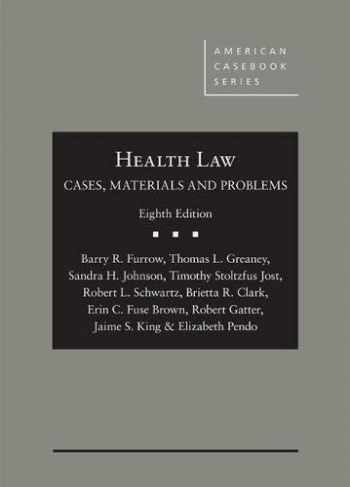 Today this book, cited by the United States Supreme Court and a host of other courts, remains the leading Health Law casebook in American law schools. The new 8th edition, which is currently in production at West Academic and which will be on your desk in July, provides up-to-date coverage of the field in all of its complexity. The book offers new cases, statutory materials and classroom tested problems, along with succinct and sharpened notes, comments, charts and other teaching materials. It is fully up-to-date as of mid-2018, and it will be supplemented by a regularly updated website and, if appropriate, printed supplements. The book is more comprehensive but shorter than the last edition; you will find that it teaches extremely well.The new edition has been carefully edited to sharpen its coverage while retaining all core materials. It thoroughly updates coverage of current issues in health insurance, accountable care organizations, the ACA, Medicare (including MACRA and “provider compare” websites), Medicaid (including the broader grounds for waivers under the Trump administration), and all the areas of conflict in today's health care political environment.While the casebook retains the structure that has served teachers and students so well, the 8th edition reorganizes the health policy and reform materials and the section on state regulation of insurance and managed care to reflect changes in the law and the industry. The ERISA materials are separated into a distinct chapter, and there is a new chapter that provides an overview of the US healthcare system, along with a primer on health economics, insurance, managed care, and the tools available to policy makers. There is also a new chapter on discrimination and unequal treatment in health care. Issues raising the inequitable distribution of health resources can be found in almost every chapter.The new edition also updates the bioethics materials so that they maintain a focus on the issues that are currently being litigated or legislated, like state conscience clauses, direct challenges to the principles of Roe v. Wade, and medical aid in dying. The casebook is written to challenge teachers and students on all sides of the issues; the authors are a diverse group with no political or philosophical axe to grind.In this edition the five original authors, Barry Furrow (Drexel), Thomas Greaney (Hastings), Sandra Johnson (SLU), Tim Jost (Washington and Lee), and Rob Schwartz (Hastings), are joined by five new authors who will be taking over future revisions of the casebook. These five new coauthors, all renowned for their teaching prowess as well as their academic work in Health Law, are Brietta Clark (Loyola-LA), Erin Fuse Brown (Georgia State), Robert Gatter (SLU), Jaime King (Hastings) and Elizabeth Pendo (SLU).